DoronD Apps contributes half of their charming iPhone game, "roll.ball.jump" proceeds to charity. The Ronald McDonald House Charities event will be held at the John Marshall Law School in Chicago, IL on the 24th of February. This event will attract an enormous amount of well wishers for the well known charity that provides a place to stay for families who are unfortunate enough to have a sick child in hospital. It is Doron's wish that his popular iPhone app: roll. ball.jump will be able to make someone's life that little bit better on this special day. If the eponymous "Ball" of the popular and fun game was a person than "he" would certainly be there at this momentous event. We like to imagine him: a Giant, Red Ball of fun and mischief actually turning up and spreading laughter and happiness amongst the charity beneficiaries and attendees of the event. Of course "Ball" only exists on an iPhone app so it is hoped that on the day good and fun people around the world will play roll.ball.jump and have a little titter to themselves as they imagine "Ball" and how he would brighten up everyone's day. Everyone who downloads the iPhone/iPad app on 24 February will have a warm feeling that not only are they going to enjoy themselves immensely, but also that their game playing is helping others as, thanks to the vision and compassion of Doron, the developer behind the game, half of all the app sales will go to charity on this day. Released in early 2012 roll.ball.jump is a game with a difference. Created from the fertile imagination of Doron, it is a fun and clever test of your skills to keep the ball moving upwards and attempt to beat your previous high scores. A lot of fun can be had with this app and more is in store in the future with planned updates. Where other jumping games seem lackluster, Doron's app has been likened to the same fun that we all had as children bouncing a bouncy ball all over "just for the sheer fun of it". Luckily in this app there's no danger of smashing windows or inadvertently bouncing your ball into someone's favorite vase! It's just good, clean fun bouncing "Ball" ever higher to beat your previous best score and using jetpacks and springs to get that little extra bounce. It must also be pointed out that it is a special wish of Doron that not just the charity event attendees but all and everyone who downloads roll.ball.jump on this day will be helping out with this good cause. Every download of the popular iPhone game on 24 February will see fifty percent of the profit going toward charity. Previous buyers of the app have been prolific with their praise on App Store reviews and the 24th February could see a flood of new reviews all attesting to the game's charm, and more importantly allowing others the chance to hear about "roll,ball.jump" and give as many people as possible a chance to contribute to this worthy cause. As our iPhones and other technology become more and more embedded in everyone's daily lives it is the wish and vision of DoronD Apps that we not only use our gadgets for fun, but also to make a little difference in the world. 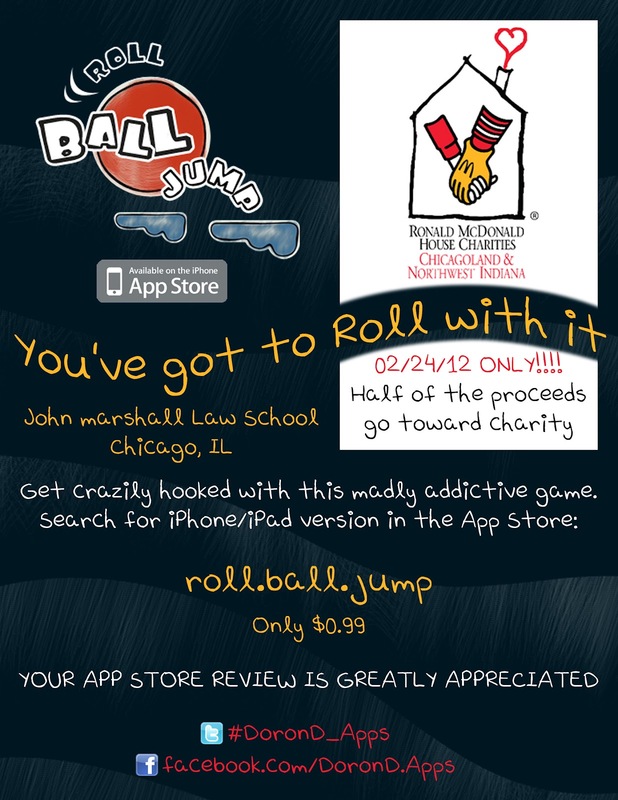 It is with great pride and hope that DoronD Apps announces its collaboration with the Ronald McDonald trust for this special day and hopes that you will see it in your hearts to support a very good cause and enjoy roll.ball.jump while doing your part for the unfortunate families who have to deal with the reality of having a poorly child in hospital.